See. That is easy. For some reason, people often say they can't cook fish. Anyone can do this. Fresh salmon with dill, lemon and toms. Oil the fish first, including the skin so it doesn't stick. Season with salt and pepper. It's important to keep that gap between the pieces BTW, as this allows the air to circulate for even cooking. Wrap up the paper into a parcel, nothing fancy, just keep the edges sealed. 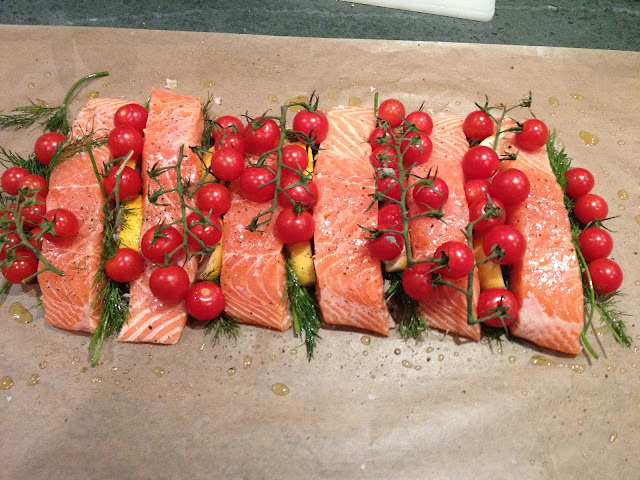 Bake on a tray at 220°C for between 12 and 18 minutes depending on how well done you like your fish. We normally do 14 mins. Tonight, we're serving this with crash potatoes, (waxy roasties with fennel seeds), honey baked chicory, French beans and a beurre blanc sauce.